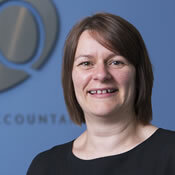 Lynne heads up our outsourcing department, Amber Accounting Services which provides support to clients on a wide range of services including bookkeeping, payroll and management accounts. Lynne joined the firm in 1993 and has successfully worked her way through the ranks to become a Senior Manager. Over the years Lynne has been at the firm she has gained vast knowledge and experience in various departments including Accounts, IT and Admin giving her an overall understanding of how the firm operates. This understanding helps her assist clients in several areas. She enjoys providing training to clients and sharing her knowledge. Her plain English approach makes clients feel at ease. Amber Accounting provides support to all sectors within EQ and she has recently been asked to join EQ Leisure as her expertise can greatly assist this sector.